Saucony Ride 9 are neutral cushioned running shoes. 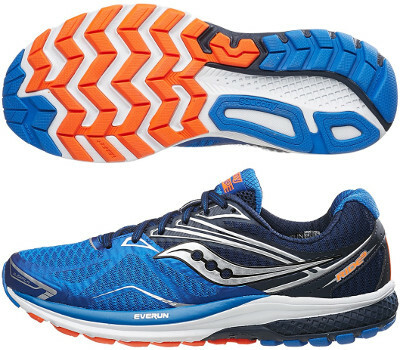 The Saucony Ride 9 is the latest model from the american brand to get cushioning technology named EVERUN™. New foam features full length layer as well as in its sibling with pronation control the Guide 9 and not only heel pad as the popular Kinvara 7. Ride 9 is a really versatile model, the typical "go-to-shoe". A great choice for neutral runners looking for a good balance between cushioning and response. Its predecessor Ride 8 already featured lightweight upper with FlexFilm™ for improved fit. Interior lining from both ankle collar and tongue are made of RunDry™ materials for great breathability and odour control resulting in optimal sanitation. Major change in Ride 9 takes place in the midsole where new full-length EVERUN™ layer has been added on top (just below sockliner) for improved responsiveness and increased cushioning. Inherited from other Saucony models like the Guide 9, SSL EVA has replaced PowerGrid™ as main foam in midsole and SRC Impact Zone extends into the midfoot for great shock absorption and fluid heel-to-toe transition. Outsole has been completely redesigned as well with new TRI-FLEX configuration (first seen in premium Triumph ISO 2) for improved flexibility and smoother ride. It is made of softer rubber (IBR+) in the forefoot to enhance cushioning and responsive ride and more durable carbon one (XT-900) in more exposed areas.